Check out this article from the NRA stating growing statistics about women and guns. Phil White over at the Firearm Blog reviews the new R51, Gen 2. While we are all very familiar with the problems of the R51 over the last couple of years I’ve made every effort to stay on top of the situation. Several writers actually had a meeting with the CEO last December during the new plant tour and talked extensively about the efforts toward redesigning the previous Gen1. Since the time of the first version difficulties there have been two teams of engineers working on a top to bottom redesign of the R51 and basically starting from scratch using the first R51 gen1 as the basis of the redesign. I was privy at the time of watching some of the first Gen 2 R51’s being assembled. These Gen 2 guns would not be available for some time because a good number would be used to further test these production models to ensure they would work as designed and advertised. To quote the CEO “it will be the most throughly tested handgun ever”. Knowing what was at stake they did a LOT of testing and fired many thousands if not hundreds of thousands of rounds during the redesign as well as tweaking the Gen 2 as the redesign progressed. The first priority was taking care of those customers who purchased the gen 1 and getting the gen 2 sent out first before any guns would be sent out for general sale. That process was completed and the guns are now shipping to distributors and gun shops around the country. My new R51 sample was received last Thursday. I’ll be testing it like I’ve never tested another pistol prior to writing it up. Because of travel plans to cover another story I was only able to fire 100 rounds so far but everything went well with no malfunctions. Many more rounds will go downrange before I post the results. I plan on shooting 1000 rounds total. Now I know some will hold a grudge and no matter what the outcome those few will still talk it down. I’m reserving judgement and being as far to Remington and our readers as possible. Let the chips fall where they may because my ultimate responsibility is to our TFB readers. Now then as I said the Gen 2 will be available this coming week for general sales. The price hasn’t changed from the original and includes a second Crimson Trace version. Huntsville, AL – Remington Arms Company, LLC, (“Remington”) is proud to announce today that the R51 has returned to the market. The new enhanced Model R51 is aconcealed carry pistol based on the Pedersen design, heritage and memorable features of the original Remington Model 51. Re-engineered from the ground up and extensively tested to deliver utmost reliability, the perfected R51 gets you on target faster and more intuitively than any other subcompact on the market. Add to that its dramatically reduced felt recoil and muzzle flip, and it’s exactly what you need to perform at your best when things are at their worst. The R51 sub compact pistol features a lightweight aluminum frame with rounded edges for comfortable conceal carry, grip safety, low bore axis for reduced recoil/muzzle flip,concealed carry trigger (light/crisp/single action), light slide racking-force for ease of manipulation, ambidextrous magazine release, locking drift adjustable sights and optimized grip angle – making it extremely easy to point and shoot. New enhancements on the Model R51 include superior slide performance with updated internals, precision-engineered extractor, locking snag-free sights, finely-tuned recoilspring, hard chromed barrel bushing, top-end single action trigger and two semi-flush 7 + 1 round magazine. of $448.00. 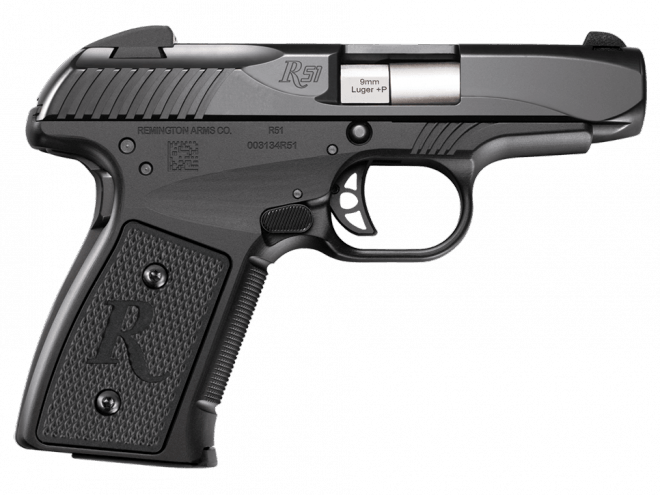 In addition, the Model R51CT features a Crimson Trace laser sight with a suggested retail price of $648.00. Thank you to Dave Spaulding at http://www.handguncombatives.com for this excellent training video. I am Woman. I Bought a Gun. This is an excellent article, please take time to read it. I bought a gun today. I took my ten-year old daughter with me. I looked down at sweet my daughter, -patient and holding Mama’s cell phone and keys at the gun counter- and I decided that I’d move out of my comfort zone just like my girl does all the time with her many 4-H projects. Warning! Some of the pictures on this blog from Gabe Suarez may be disturbing to some of my readers. But, then again, all you have to do is turn on the news these days to feel disturbed at the violence this world faces. What Does “Unarmed” Mean Anyway? As many have said before me, guns don’t kill people, people kill people. Violence is violence. Without directly engaging the issue of police bias or excessive use of force (about which I do not know enough to engage intelligently), I do want to address the issue of people being “unarmed” at the time of their encounters with law enforcement officers. People often declare “the victim was unarmed at the time” to suggest that lethal force was not justified. But one of my best friends is an expert in the martial arts and could certainly kill me with his bare hands very quickly if he wanted to (not to mention his rattan sticks). I recently wrote about Crimson Trace’s interesting banner at the NRA annual meeting in Louisville. The banner depicted 5 individuals using guns with Crimson Trace lasers to defend themselves. A majority (3 of the 5) were female, reflecting Crimson Trace’s heavy marketing to women. And yet the body language of the men depicted (leaning in aggressively) was very different than the women (leaning back defensively). 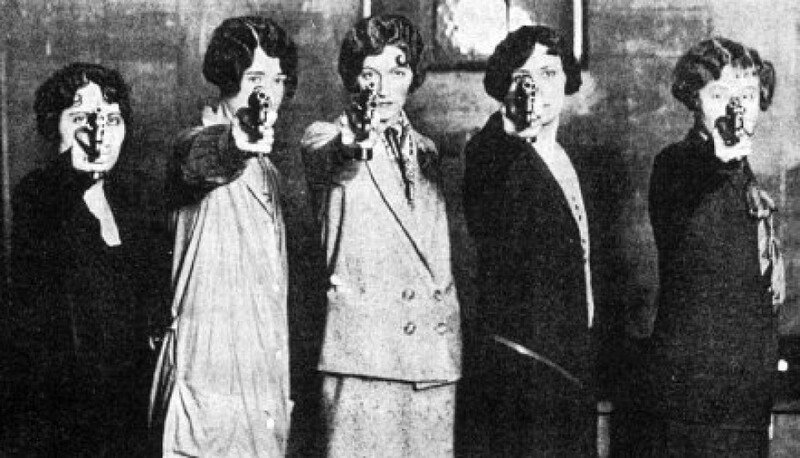 I found that noteworthy as gun culture continues to attempt to bring more women into the fold. This was fresh in my mind while I was going through some old gun magazines recently, again looking at the advertising more than the content. I was struck by a pair of ads run by Crimson Trace in The American Rifleman in 2009.